Interest rates were low in 2016, and Realty Income's stock price got high. The company took advantage of both. 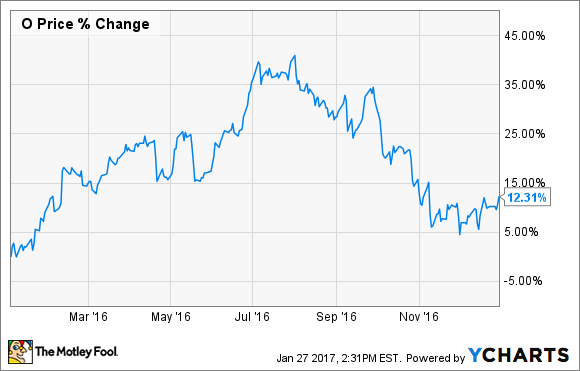 Realty Income's (NYSE:O) stock price had a bit of a roller-coaster ride in 2016. After rising 40% by August, Realty Income proceeded to drop 20% in the latter five months of the year mainly thanks to the prospect of rising interest rates. Despite the big moves in the stock, the company's business did just fine, especially in terms of growing the company. Here was Realty Income's best move in 2016, and what investors should know going forward. Realty Income did a great job of using cheap capital to acquire more properties. Image Source: Getty Images. Realty Income experienced a REIT's dream scenario throughout much of 2016. The market for high-quality acquisitions was robust, and raising capital was cheap and easy. And I believe the company's best move in 2016 was taking full advantage of this opportunity. At the beginning of 2016, Realty Income was expecting to acquire about $750 million worth of new properties. As the year went on, this target was increased not once or twice, but in all three 2016 quarterly reports issued so far. Realty Income completed $353 million in acquisitions during the first quarter alone -- nearly half of its initial full-year estimate. CEO John Case said "We continue to see an attractive pipeline of investment opportunities..." and went on to discuss Realty Income's sector-leading cost of capital and efficiency, raising the full-year acquisition target to $900 million. The company completed another $310 million in acquisitions during the second quarter, and it seems that circumstances were even better (just look at Realty Income's stock price toward the middle of 2016 in the chart below). In fact, Case told investors that the company's acquisitions in the first half of 2016 were completed at record-high investment spreads relative to Realty Income's cost of capital, and that the pipeline of investment opportunities remained strong. The full-year acquisitions estimate was increased again, to $1.25 billion. The third quarter was even stronger, in terms of volume, with $410 million in high-quality acquisitions completed, and the full-year target raised to $1.5 billion. To be fair, cost of capital certainly rose in the fourth quarter, so I wouldn't be surprised if Realty Income fell short of this ambitious target when it reports year-end results, but even so -- going from an initial projection of $750 million for the year to acquiring $1.1 billion in properties through just three quarters is impressive. What does "cheap capital" mean? REITs tend to fund their operations in two ways, depending on which seems the more attractive option at the time. They can either issue debt, or they can issue equity by selling more shares of stock. Realty Income capitalized on both in 2016. The company's major debt offering occurred in October. Realty Income took advantage of near-record-low interest rates by issuing $600 million in 10-year senior notes at an effective yield of just 3.15%. Lower borrowing rates typically lead to better profit margins on acquisitions, and this was Realty Income's lowest yield ever on a 10-year debt offering. Realty Income also took advantage of equity issuance throughout the year, with the bulk of new shares sold during the second quarter. In all, the company issued $489.6 million worth of new equity at an average share price of $61.62, which represents a premium of roughly 19% over where the stock started 2016. Here's why this is significant. Let's say that Realty Income wants to acquire a property for $12 million. If its stock is trading for $50, it needs to issue 240,000 shares to raise the capital. However, if the stock is trading for $60, it only needs to issue 200,000 new shares to fund the exact same acquisition. Said another way, Realty Income was able to acquire lots of properties, without diluting its stock as much as it would have a few months prior. I mean the following statement in the best possible way: Realty Income is a generally boring company. What I mean by that is that investors don't get many surprises, especially unpleasant ones. Aside from adjusting its acquisition plans, not much else happened in 2016 that should have been surprising to shareholders. The company increased its dividend as expected, property occupancy stayed predictably high, and each quarter, Realty Income's results were very close to expectations. In fact, looking through the entire list of Realty Income's 2016 press releases, I can't find any that aren't about the company's dividends, quarterly earnings, or the capital-raising activities I already mentioned -- which means that the company is generally hitting its goals and sticking to its plan. So, while Realty Income's stock price may rise and fall significantly over shorter periods of time, the business itself delivers predictable, consistent returns that have historically translated into exceptional long-term performance.